Country Superstar Johnny Cash was a music industry legend for half a century with an instantly recognisable voice and style. The hit movie "I Walk the Line" introduced his dramatic life story and his unmistakeable, tough music to a younger generation of music lovers. Johnny Cash fans now cover three generations. 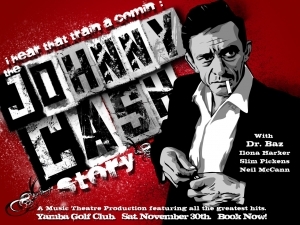 Even people who might secretly confess to hating Country Music are nevertheless fired up with enthusiasm about his legendary up-tempo hits such as Folsom Prison Blues, Ring of Fire, Get Rhythm, I Walk the Line - there are just so many great and unique songs in the Johnny Cash repertoire. Those familiar with the highly successful bio-pic will know of the enduring love story between Johnny Cash and June Carter. A member of the iconic country music group The Carter Family, June grew up in showbiz and became an accomplished comedienne. singer, and song writer - a true music professional and star in her own right. Together they were a towering force in American Music. Vocalist & writer Barry Ferrier has brought together a team of talented performers to create an immersive music theatre show based on the Cash Story and interaction between these two gifted and unique music artists, told in the first person with insights into Johnny & the Tennessee Two's wild ride from obscurity to stardom. Barry Ferrier met outstanding vocalist and musician Cammie Lindon in the ealy 70s at a Christian concert at which they both appeared held in Hyde Park Sydney. They began rehearsing together while Cammie was still at shcool. Cammie later was recognised for her outstanding musical ability by Bob Hudson who arranged for her to support Leo Kottke at Sydney Town Hall, and performed some of Barry's songs in this show. For a period after this the two performed together in an acoustic trio with Roderick Morgan at small venues around Glebe. 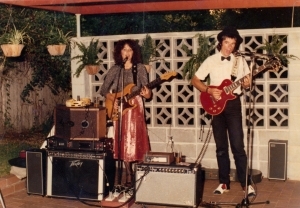 In the late 70s after the Jesus Christ Superstar run had finished, Barry and Cammie Lindon reconnected and developed a successful music career together, first as a duo Lindon Ferrier, and later performing around Sydney and Melbourne with their theatrical funk rock band Skeleton Crew with Peter Leighton on drums and Chris Doyle on bass (who Barry met in Jeff St John and Sacha). They were joined for a period by English keyboardist and syntheziser pioneer Andrew Thomas Wilson (who Barry met during his period with the Lindsay Kemp company). This band was very popular around Sydney, was supported by a fledgling Icehouse at the NSW Uni Roundhouse, and after touring Queensland, featured in a revival season of Steve J. Spears' politically charged but highly melodic piece "Africa the Savage Musical" at the VCA Theatre in Melbourne. Lindon Ferrier recorded singles at United Sound Studios with producer Spencer Lee and who secured a recording contract for the duo with international label RCA. They appeared on the ABC's legendary "Countdown", appeared live to air for a Double JJ performance, and supported Ry Cooder and David Lindley at the Palais Theatre in Melbourn. Cammie, who was NSW trombone champion as a teenager, brought the house down with her rendition of Randy Newman's "Guilty" featuring a trombone solo lying on top of the grand piano, and the standing ovation they received caused them to be sacked as support group. They also were support act for the very weird Norman Gunston Christmas Show, and made further regional television appearances together. Their single received high rotation airlplay but wih zero support from RCA they were not able to gain great sales. During this period they were managed (though not very successfully) by Australian Music industry legend Harry Widmer (1926-2002), a man of extraordinary versatility - a painter, landscaper, house designer, builder, jewellery-maker, industrial designer, band manager, music promoter, car and boat designer and civic campaigner, as well as a swimming coach and prominent businessman, and he spoke four languages. Queensland-born, Harry was been taken to Zurich to be educated at age four and received a multilingual education, including a Swiss degree in industrial design. He completed compulsory service in the Swiss army (along the way becoming a national cross-country ski champion) and was later in the Australian army reserves, holding the rank of sergeant in the CMF Intelligence Corps. He returned to Australia in 1946 but despite his great intelligence and his many talents, he now spoke almost no English and couldn't get a job, so he filled in time designing and making jewellery for Proud's while he learned English. He took a position as a storeman for the General Motors distributor Stack's, but soon moved on to designing the showroom displays. 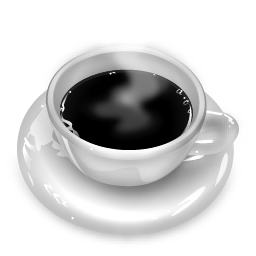 An offer to work in the design department of the British Motor Corporation followed. By 1961 he was director of industrial design at the electronics company Kriesler, a division of the massive Dutch Philips group. One of the many awards he won was the F.H. Edwards Laurel Award for 1966 for designing the Kreisler Mini 41-47 radio with polypropylene plastic case. The use of this material would later become commonplace, but the competition judges noted this was the first such application anywhere in the world. In the late Sixties he moved into the music scene, managing bands and performers including The Executives, The La De Das, Kerrie Biddell and Doug Parkinson and setting up a music agency, Cordon Bleu. With the assistance of Melbourne poet Adrian Rawlins, Harry helped to finance the La De Das acclaimed 1969 LP The Happy Prince. Barry had met adrian Rawlings through the Meher Baba movement, and a further connection was Celia, one of the Cordon Bleu booking agents who was also a member of Jeff St Jophn & Sasha (for whom Barry played lead guitar). 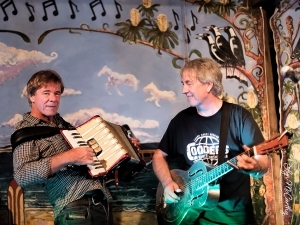 During this period Barry performed extensively across Sydney as a solo act for Cordon Blue. Harry had Barry Ferrier and Cammie Lindon with band fill in for the Executives for a concert at Sydney Town Hall. Harry summed up his band management theory as making sure "all our selected management groups earn enough so they can stay together, live like human beings and improve musically". Harry was also chairman of the PACT experimental theatre and arts organisation, working to lift the profile of actors, directors and producers (Peter Weir and Graham Bond among them). Eventually Harry was offered the position of design director of the 212 British affiliates of the Philips electronics group and the family to move to England in 1971. They returned to Australia in 1974. At this time Harry moved into music full-time, managing more bands and artists and developing a new theatrical booking agency. His new Windsun agency signed up 117 venues from Port Morseby to Perth, while Harry's new television packaging company - started soon after - became heavily involved on the production side, making documentaries and music shows. Caron Mayda Lindon, affectionately known to family and friends as Cammie, was born 13th November 1955 in Sydney, Australia. She was the second child of five siblings, born to Richard and Jean Lindon, both professional vocalists. In 1982, she was pipped at the post for the lead role in the Australian hit musical comedy movie, Starstruck and was given the role as "the backup singer". Caron died on June 21st 1999 in Sydney at the age of 42, after a four-year long battle with cancer. Barry and Cammie had a child together, Rachel Jean Ferrier. 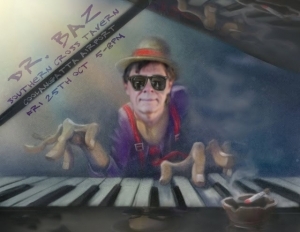 Dr. Baz is a dazzling guitarist but in addition, through his desire to write songs at the piano, has gradually moulded himself into a very accomplished piano player, adding an extra string to his musical bow, and over the past ten years he also has begun to perform regularly as a pianoman entertainer in clubs, hotels and weddings across the Northern Rivers and Gold Coast. He has entertained at literally scores of weddings and corporate functions, delivering his smooth renditions of a wide range of ballads, pop classics, fun swing tunes and dynamic cover songs. He has the versatility to cross over between genres and serve up the great jazz standards, swing blues, and the hits of the great piano songwriters such as Billy Joel and Elton John with a warm, sophisticated sound. His extensive repertoire includes soulful interpretations of Leonard Cohen, upbeat country from Johnny Cash, and stirring versions of many of the great songwriters and singers, contemporary hits, but also travelling back in time to the fifties rock of Elvis and Jerry Lee Lewis, 60s classics by the greats such as Bob Dylan and the Beatles, and some great Aussie pop songs... it’s all great entertainment. 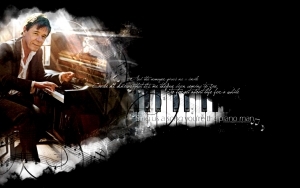 His piano style really swings and his voice has a texture and deep authority. It’s just a lot of fun! Requests can be written on a fifty dollar note!